Kris Harper of Intercity Transit offered up a cheery smile and a piece of fruit to all who stopped by. 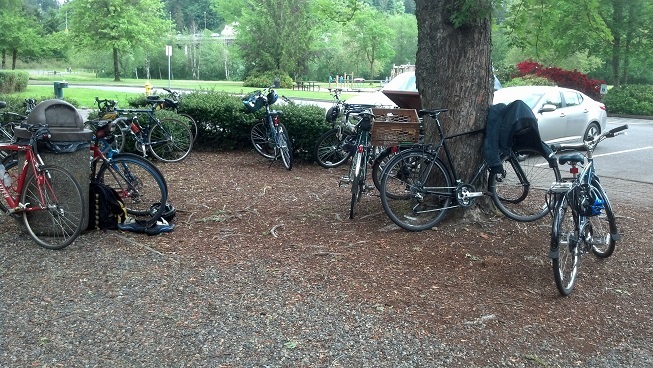 After a couple of days at a conference in Grand Mound talking about our bike tourism work my week ended in Olympia, where Intercity Transit supports the Bicycle Commuter Challenge. Staff member Duncan Green spends 6 months of each year organizing and running the BCC. The coffee never stopped pouring at the Olympia energizer station at Ralph’s Groceries. The BCC has taken place continuously for 27 years, coincidentally the same age as our organization. 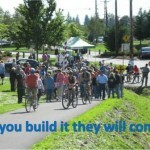 We have a hunch this makes Thurston County’s BCC the longest-running commute challenge in the state. Anyone have one older that has operated every year since its founding? 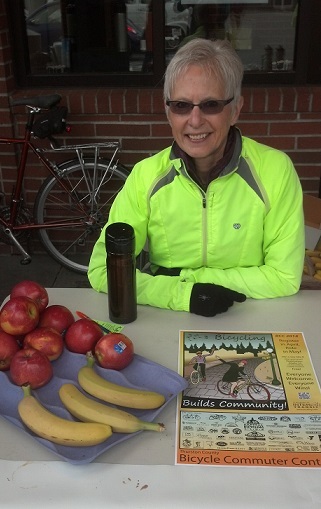 My hosts and I rode the 6.8 miles into town and stopped at the busy energizer station at Ralph’s Grocery, warming up with coffee and some fruit and chatting with Bike Tech shop owner Dale Plant, Kris Harper of Intercity Transit, and others. Duncan Green (left) has organized Thurston County’s Bicycle Commuter Challenge for years. 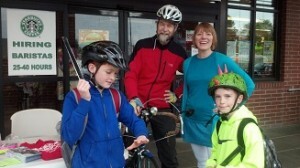 The boy at left gets ready to put on his reflective slap band with great enthusiasm. After the coffee stop Maxine and Ray took off in one direction, I went the other to find my first meeting of the day, taking advantage of Olympia’s bike lanes. Along the way Andrea Bell stopped me to ask if I knew where to find a good breakfast. 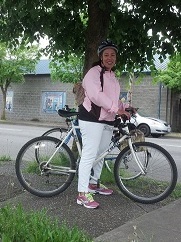 She’d ridden from Tacoma to Olympia to check out the regional trail network and it was time for some calories. I don’t know downtown Olympia well so I could only suggest Wagner’s, with its beautiful case full of sinful sugar bombs and great deli salads (a stop every time I’m in the capital). 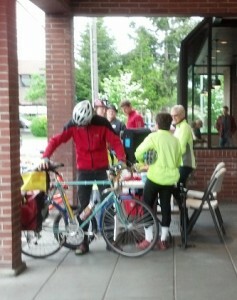 Andrea Bell, bike commuter, rode the trails from Tacoma to Olympia to enjoy the outdoors (and find some breakfast). 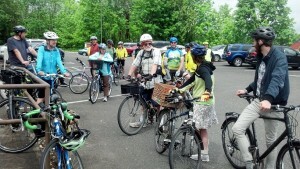 At midday I joined 70 or so state employees for the Interagency Bike to Work Day picnic. We rallied in the parking lot of the General Administration (GA) building and biked to Tumwater Historical Park for snacks and a drawing for prizes. Organized by our friends at the Dept. of Transportation along with the Dept. of Revenue, the ride draws people from DSHS, DFW, and other departments and divisions — your healthy state government at work! Washington state employees gather for the midday Interagency Bike Ride on Bike to Work Day 2014 in Olympia. After the picnic I rode the trail through the park and around Capital Lake with BTW Coordinator Duncan. We stopped to chat with someone from the local paper there to check out a falcon’s nest high in an old dead snag. Meanwhile, back in Spokane they were winding up the week with the Wrap-Up Party at River City Red. My commutes to begin and end the week had a beautiful symmetry, with a trail alongside water accessible from city streets to give me some time in Washington’s great outdoors. 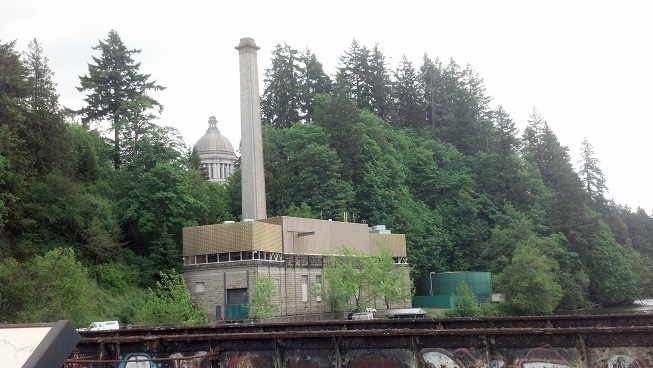 A different view of Washington’s state capitol: From the trail around Capital Lake, returning from Tumwater Historical Park. What you can’t see: the falcon’s nest in a dead snag just to the right of the tall chimney stack. Start to finish, Bike to Work Week educates, celebrates, and inspires. It’s never too late to bike to work or bike to everywhere; the National Bike Challenge keeps rolling through September. Bikes wait for their riders during the Interagency Bike to Work Day picnic. 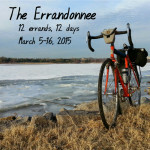 We’re Back with the National Bike Challenge! 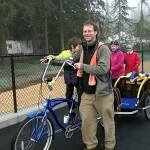 This article was posted in Bike to Work, Events, News, Thurston County. Bookmark the permalink. Follow comments with the RSS feed for this post. Both comments and trackbacks are closed. 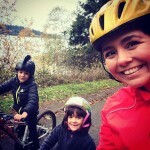 There are no bike trails from Tacoma to Olympia so I’m curious about Andrea Bell’s route. The roads I’m familiar with vary from bike lanes to white knucklers. There is really no efficient bike friendly route between these cities…hint, hint. 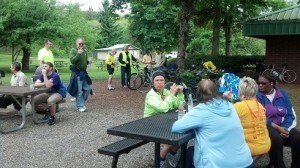 Maybe she headed from Tacoma to Olympia to check out the Thurston County trails. I didn’t get her email–can’t follow up to ask. Maybe she’ll see this and tell us her route! We hear and love the hint 🙂 — always working to get more comfortable regional connections. Oh gosh, Wagners is the best thing about Olympia. I used to work a block away, and we always fueled up there in mid-morning.